DNS: Each BeyondTrust Appliance needs a physical connection to the network and a separate IP address. Additionally, a Domain Name System (DNS) record for each appliance is recommended, along with the DNS A Record or a Canonical Name (CNAME) record pointing to the appliance. The simple yet descriptive name is a useful approach. For instance, a company named 'Example' might use access.example.com for their DNS record. 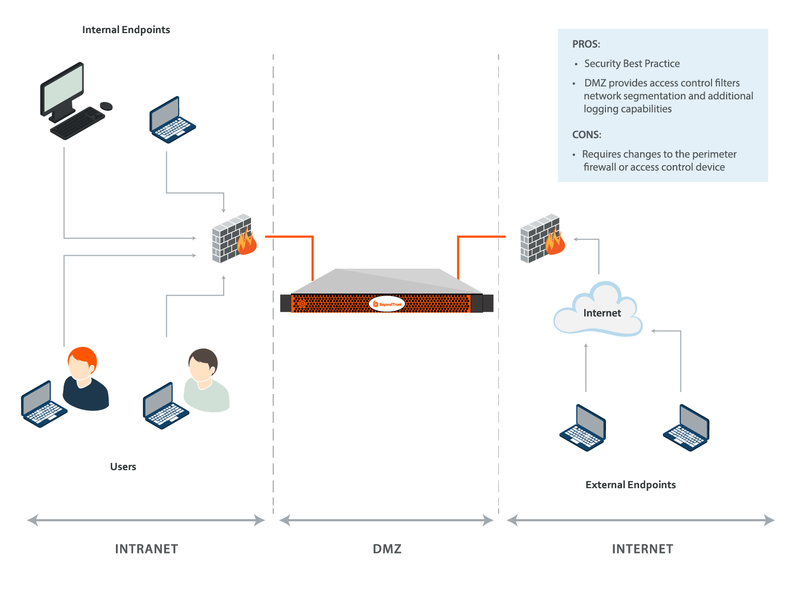 DMZ Deployment (recommended): Deploying the appliance into a perimeter-based DMZ segment meets security best practice standards and is BeyondTrust's recommended location for the secure deployment of the device. A DMZ, or de-militarized zone, is a network that is protected by access control mechanisms. Access control may be provided by a firewall device, a router, or a switch that provides port and address filtering capabilities. The purpose of the DMZ is to limit access to systems that are deployed within it. In the case of the BeyondTrust Appliance, the DMZ will limit connectivity to the device and allow access only to the appropriate ports. 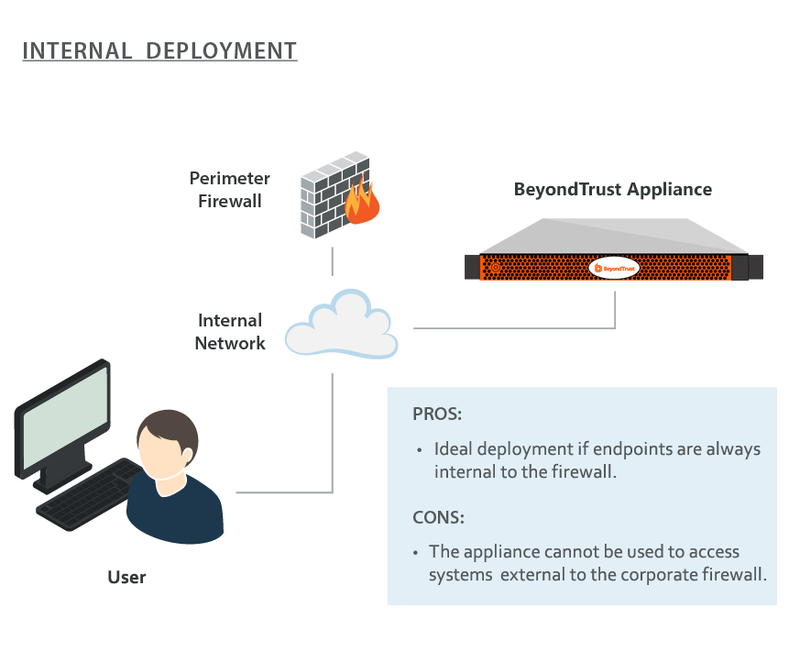 External Deployment:In situations where a DMZ does not exist and is not possible due to technical or business constraints, the BeyondTrust Appliance may be deployed external to the perimeter firewall. The appliance consists of a hardened operating system and applications that are designed to be directly accessible. Internal Deployment: Deploying the BeyondTrust Appliance on an internal network segment is ideal when the client base is completely internal or accessible through a VPN. No firewall changes are required because the device and all of the endpoint clients are internal to the firewall. 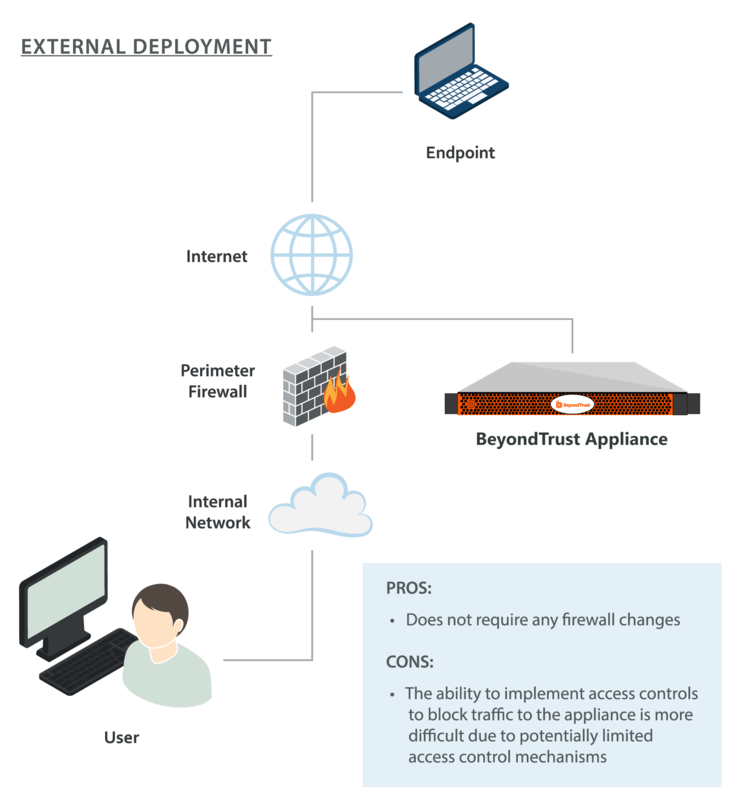 In environments where the remote systems are external to the firewall, BeyondTrust recommends this deployment location only in the event that a DMZ does not exist or when the appliance cannot be deployed externally. An internal deployment of the appliance requires numerous changes to the environment and a solid understanding of perimeter firewall controls and Network Address Translation.